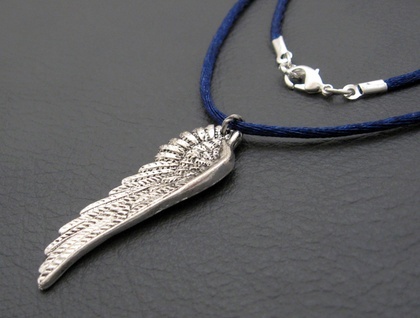 Argyros necklace: a lifelike, antiqued-silver coloured wing pendant on deep blue satin cord – last one! 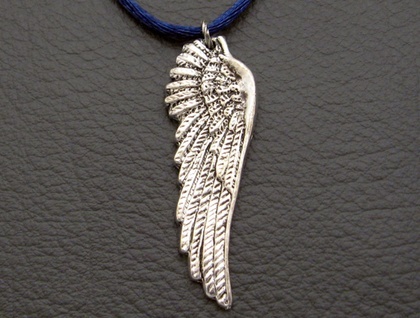 A highly detailed, antiqued-silver coloured angel wing is suspended on midnight blue, satiny cord. 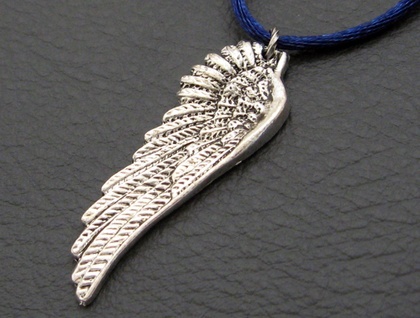 The pendant is made of silver coloured alloy, and has been antiqued to show up its beautiful, lifelike feather details. This simple necklace fastens with a high quality, silver plated lobster-claw clasp which clips into a twisted, silver plated ring. This is a very elegant, unisex Silverlight Jewellery design that can be dressed up or down. The satin cord feels lovely against one's skin. This is a limited edition design: only one of these necklaces is still available. 'Argyros' is a Greek name that means 'silver'. 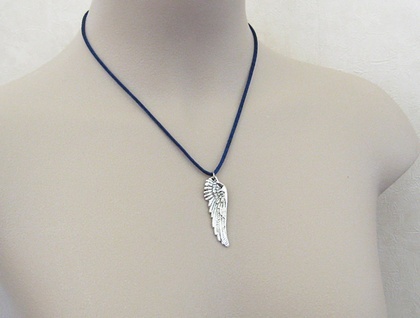 The necklace measures 48cm, including the lobster-claw clasp and the ring, while the wing pendant measures 49mm lengthwise and 17mm across at the widest point. If you would prefer a different clasp or an extension chain, simply leave a message in the ‘notes for silverlight’ field that will appear when you check out of Felt, stating what you would like and how long an extension chain you require.